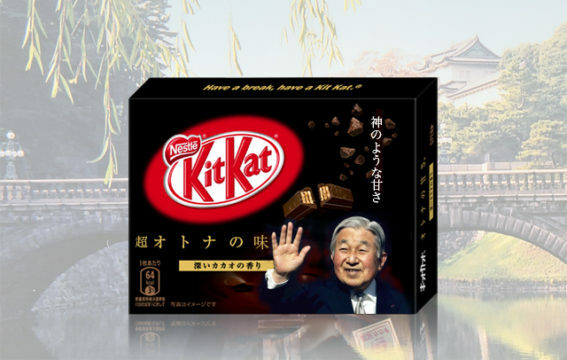 Nestle Japan has announced the release of a new product in celebration of the abdication of Japanese Emperor Akihito. “We encourage everyone to have a break, have an abdication KitKat,” says Nestle Japan CEO Jigoku Ikukamo. The limited edition Emperor Akihito flavored KitKat is now available to purchase in selected stores around the Kanto region. “It has an extreme adult taste with a hint of heavenly sweetness,” says Jigoku Ikukamo. Nestle Japan says since the announcement they have had an overwhelming number of requests to produce the Princess Mako flavored KitKat. I don’t find it funny at all. Be careful when you make fun of other culture. It’s cute, but you know that you are asking for a world of hurt from the uyoku asshats.